Motoring clichés are easy to come by, but every now and again a car comes along that’s so brilliant that it qualifies for every stock phrase and cliché you can find. The original Audi R8 was one of those cars: it was revolutionary, a game changer and it really did handle like it was rails. Launched in 2007, the R8 was a masterstroke. Not only did it fulfil Audi's mandate to create a world class supercar to rival Ferrari and Porsche, but it also set benchmarks for everyday usability. As a result the R8 was as easy to drive as TT in town, but capable of beating a 911 or 458 at the track. Now the second-generation R8 is here and it's more powerful than ever before. Given the brilliance of the old R8, it's perhaps understandable that Audi has retained the look and feel of the original. The exterior is almost identical to the outgoing car, using the same flat, wide and muscular body shape with a mid-engined layout. The naturally aspirated and high-revving V10 has also been kept, along with the quattro four-wheel drive system and S tronic transmission. There are some important changes under the metal though. The R8 gets a lighter aluminium chassis that cuts 15 per cent from the kerb weight, thanks to the use of carbon fibre in key areas. The V10 has been reworked to provide more power and up to 24.8mpg, with the latter achieved by cylinder on demand technology that switches off five cylinders when they're not needed. On the downside, entry-level V8 models and the manual gearbox are no longer available, which means the R8 is more expensive with prices starting at £119,500. The V10 is theatrical, flamboyant and brilliant though. It starts up with a chorus of crackles and pops plus it thunders along at sub-30mph with surprising grace. The steering is light and responsive while the large mirrors provide excellent all-round vision. The pedal action is also refined, which means you can apply small amounts of brake or throttle in traffic, without the usual supercar jarring. On the open road (and race track) the R8 is scintillating, with outstanding acceleration and a wonderful soundtrack that builds with the revs. In standard form, the 540PS V10 will complete the 0-62mph dash in 3.5 seconds, while the V10 Plus (with 610PS) will lower the sprint by 0.3 seconds. As with the previous R8, the engine is high-revving, smooth and exceptionally fast, with maximum power flowing all the way up to 8250rpm. As well as cutting weight from the chassis, Audi has managed to increase body stiffness by 40 per cent, which means the R8 is a lot flatter and stable in the corners. This means it is very forgiving, even at the limit, while the four-wheel drive system is notably better too, diverting 100 per cent of the power to the front or rear wheels within milliseconds. The seven-speed S tronic automatic gearbox works well with the V10, holding the gears in the corners and providing rapid changes as you push it on the straights. The R8 is fitted with a new set of driving modes that let you tailor the handling and exhaust note, but there's plenty of fun to be had in even the most sedate settings. While the dynamic steering impresses, it still lacks the precision of the 911, which feels sharper with more feedback in the corners. However, the R8 rides extremely well and will easily cope with the roughest of surfaces. As a result it will be well prepared for Britain’s pothole laden roads. 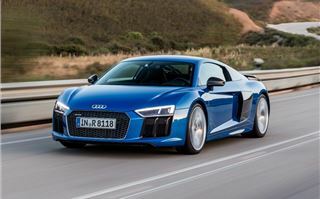 Audi has also given the R8 a new cabin. This means the driver gets the same Audi virtual cockpit system as the TT, along with a redesigned multifunction steering wheel that lets the driver start the car, change the driving settings and program the infotainment without lifting a hand from the wheel. The cabin gets a step up in trim too, along with big improvements when it comes to attention to detail. On the old car you would find a loose piece of carpet fitment or some creaky plastics, but not here. On the downside, storage is limited, with a 112-litre boot in the front and a small shelf located behind the driver. We also found the standard seats to be lacking in lower back support, which means they're not particularly comfortable on long trips. Given the choice, we'd choose the V10 Plus with 610PS over the standard engine. It's sharper, faster and gets fade-resistant ceramic brakes as standard. Plus there's a set of bucket seats that are miles better than the standard set. The Plus also gets some exterior enhancements, with a large fixed rear spoiler that makes the R8 look more purposeful. To be honest, criticising the new R8 is extremely tough - it's a brilliant supercar. Yet, if pushed for a sticking point, we'd probably cite the fact that it lacks any recent racing tech. When Audi built the original R8 it put everything it had learnt from its Le Mans race car into it. We’re more than a little disappointed that Audi hasn't utilised the hybrid know-how that has given it numerous 24 Hours victories. However, that aside, the R8 is still drives like it’s on rails, and surely that's all that really matters when it comes to 205mph supercars? 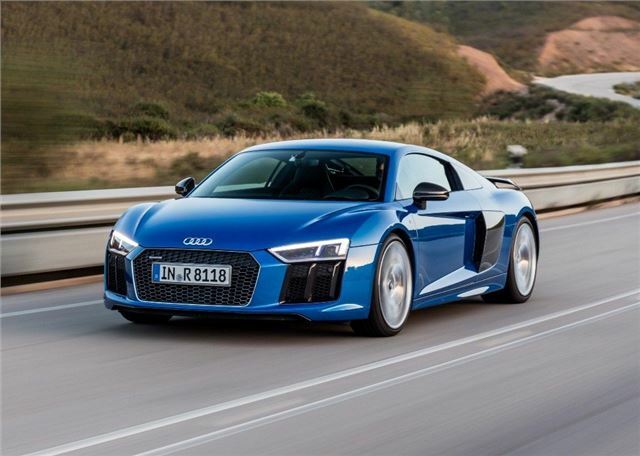 The Audi R8 is on sale now, with deliveries starting in December.